Eggplant, tomatoes, olives, pine nuts and a whole lot of love. She may be most know for her gutsy nose-to-tail cooking. But celebrated New York Chef April Bloomfield wants you to know she’s equally equipped with root-to-shoot flair. Her first cookbook, “A Girl and Her Pig” (Ecco, 2012) may have been meat-centric. 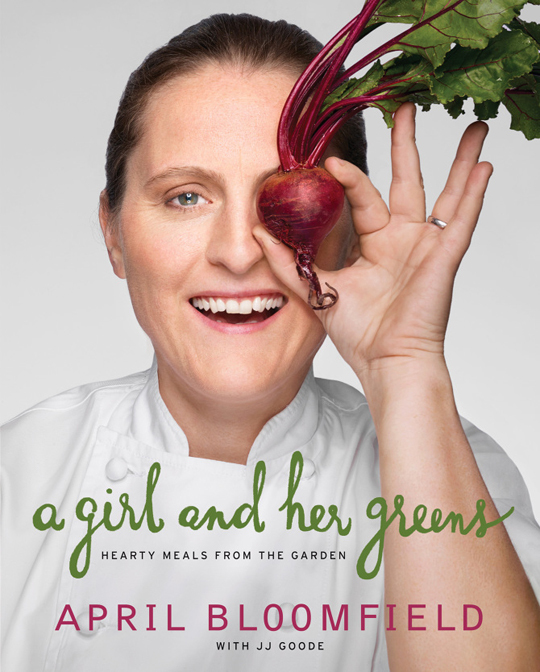 But her follow-up, “A Girl and Her Greens: Hearty Meals from the Garden” (Ecco), decidedly puts the emphasis smack dab on a cornucopia of seasonal fruits and vegetables. First of all, you’ve just got love the name. 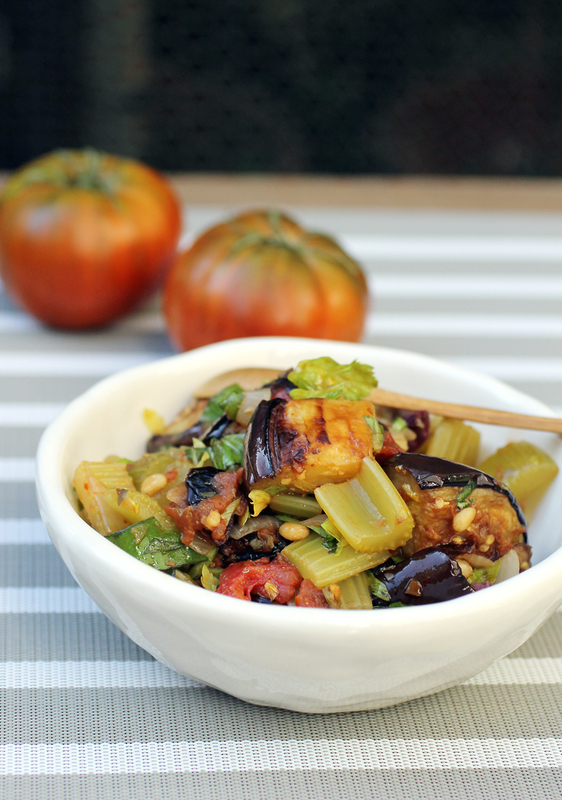 Second, I’ve always loved the versatility of this Sicilian eggplant salad that’s typically served at room-temperature. It’s great as a side to perk up most anything. Its sweet-tangy flavor and chunky texture makes it ideal to spoon atop crostini or fold into an omelet. Oftentimes, though, caponata is too tart or too sweet or takes on a mushiness. It’s hard to find one that is ideal. When you read Bloomfield’s recipe, you might question the meticulousness. Do I really need all that celery? Do I need to cook it that long? And do I really have to cook the eggplant separately? Really? Yup, you kinda do — if you want it to turn out as fabulous. There is an abundance of celery. And yes, you cook it slow and low with onions for longer than you think you must. But once you taste how incredibly sweet they get, you realize why you need to be so patient. 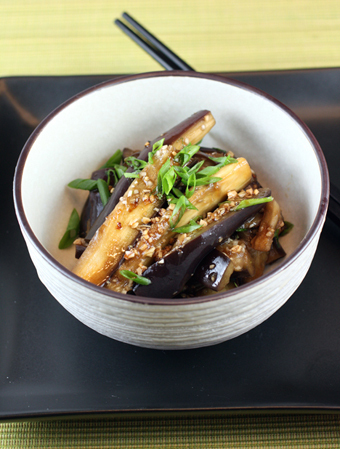 The eggplant is salted, and yes, cooked separately. 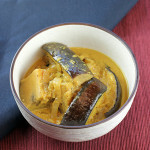 It leaves the eggplant ever so creamy with crisp edges. A restrained amount of red wine vinegar, chopped olives, chopped capers, fresh basil added just before serving, and toasted pine nuts get tossed with everything to add tang, brininess, brightness and soft crunch. It’s rather miraculous how everything melds together, yet somehow every ingredient still remains distinctive and gets its due. I didn’t change a thing with this recipe. After all, if it ain’t broke…. 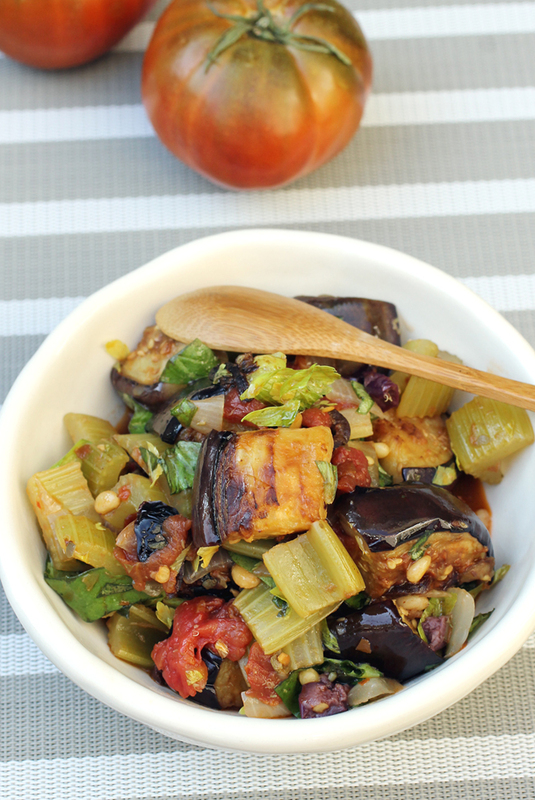 Just imagine all the ways you can enjoy this caponata. Toss the eggplant and kosher salt together in a colander and set the colander over a bowl. Let the eggplant sit for about 30 minutes. Meanwhile, quarter the tomatoes and trim off any pale bits. Hold each chunk over a bowl, and use your fingers to push out the juice and seeds. Strain the juice, discarding the seeds. Finely chop the tomatoes. Heat 3 tablespoons of the oil in a medium pot over medium-high heat until it shimmers. Add the onion, celery, garlic, and 1 teaspoon of the Maldon salt. Cook, stirring and scraping occasionally, until the onion is translucent and begins to stick to the pot, about 10 minutes. Lower the heat to medium and cook the vegetables for another 10 minutes. Add the chilies and keep cooking, stirring and scraping occasionally, until the vegetables are light brown, soft, and sweet, about 10 minutes. Stir in the tomatoes and their strained juice and let the mixture simmer, stirring now and then, for about 15 minutes. Pat the eggplant dry. Heat the remaining 1/2 cup of olive oil in a medium heavy skillet over medium heat until it shimmers. 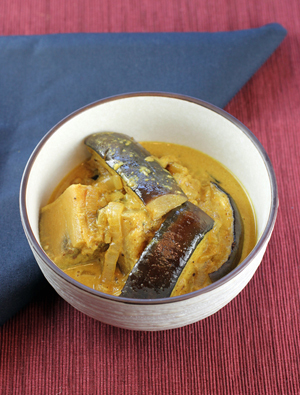 Cook the eggplant in two batches to avoid crowding the pan, turning the pieces often and adjusting the heat if necessary, until they’re deep golden brown on the outside and creamy inside, 10 to 12 minutes per batch. Put the eggplant on paper towels to drain. Let it cool to warm. Transfer the eggplant to a large bowl, sprinkle with the vinegar and a pinch or two of Maldon salt, and give a very light stir, being careful not to smoosh the pieces. To the bowl, add the tomato mixture, olives, pine nuts, capers, basil, and a small handful of the reserved celery leaves. Have another gentle stir, and season to taste with Maldon salt. The caponata will keep in an airtight container in the fridge for up to 3 days, but you should always serve it at room temperature. tagged with A Girl and Her Greens recipe, April Bloomfield recipe, caponata recipe, eggplant recipe, what to do with all that eggplant? A great combination! It looks delicious. Great recipe. Always trying to get the S.O. 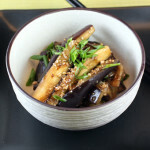 to eat more eggplant! I can’t wait to try this caponata. It does sound perfect. I completely agree with her decision to omit raisins! i’m such a fan of hers, and not just because of her accent. 🙂 mostly i think she comes up with delicious recipes and this is most certainly one to be noted!